Wisconsin’s Arts In Hand has been recognized for its advocacy, vision and support of the creative economy of northwest Wisconsin. • August 1999 the initial meeting of people interested in art formed Wisconsin’s Northwest Heritage Passage. They were inspired by the tourism guidebook, “The Craft Heritage Trails of Western North Carolina” and had a vision to publish something similar. US Highway 63 with 13 counties became the focal area. “An Invitation to Journey from the Great River to the Great Lake” or from Pepin County on the Mississippi River to Ashland County on Lake Superior. • Decision was made to publish a map first and a book at a later date. In 2001, the first map had beautiful photos of artwork and produce with listings of galleries, studios, farm tours and heritage sites. This map was updated and expanded with second and third editions following in 2004 and 2009. Each time, more than 10,000 maps were distributed to tourism offices throughout northwest Wisconsin. 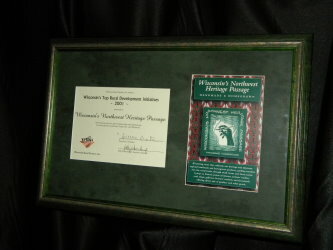 • The board’s vision to publish a guidebook became a reality and was published in 2011, “The Wisconsin Passage: An Adventure in the Handmade, Homegrown and Historical offerings from the Mississippi River to Lake Superior.” For information about purchasing the book, contact Arts in Hand or visit Arts in Hand Gallery in Spooner WI. • The Arts in Hand Gallery was opened in 2013. • In 2015 the gallery moved to present location at 210 Walnut Street Spooner. The gallery has its own store front. Since that time, the number of artists has more than doubled and so have sales. The quality of art work has always been high and the customers appreciate the variety available. The gallery is staffed by volunteers. Classes are also available. Please check the Calendar of Events for class times and special events. EVERYONE is welcome to attend board meetings — including you! Wisconsin’s Northwest Heritage Passage has been recognized for its advocacy, vision and support of the creative economy of northwest Wisconsin. 2014: We received a Wisconsin Arts Board Creative Communities Grant which was used for a Creative Tour to 5 businesses. Participants were Thunder Willow Community Arts, Sew Little Time Quilt Shop, Kinnickinnic Claywork, Color Crossing and Topstitchery located in St Croix and Pierce Counties. The goals of the program were to expand the community reach of each studio, increase community’s participation in art, build a stronger local arts community, support small independent art studios, offer the public educational, creative experiences, and celebrate the joys of creating and working together. 2014: Sheep 2 Shawl We received a Wisconsin Arts Board Creative Communities and Partnership grant to help us promote this event. The purpose was to show people how fiber comes from an animal, to being prepared, and to become a garment. Live sheep were sheared, and llamas groomed; rabbits sat while being groomed and their hair spun, etc. 2014: “Midwest Living” published an article with many photos of WI NW Heritage Passage. Several galleries and studios were included. The guidebook was part of the article, prompting people to purchase it and to visit the area and what we have to offer.2009-2010: We are recipients of Wisconsin Arts Board Creative Communities and Partnership grants that are funding three special educational programs. Sep. 18-20, 2009: “Spend a Day at the Farm” hosted by Rose and John Brunclik at On Twin Lakes Farm and Store in Birchwood allowed the public to participate in an up-close experience harvesting crops and seeing what life on a working farm is like. February 2010: “Fabulous Fibres and Textiles” hosted by Patty Johnson at Color Crossing in Roberts. On Feb. 13, a day-long open house invited visitors to explore the many facets of textile crafts such as weaving, crocheting, knitting, doll-making, rug-hooking. The month-long event also included class offerings as well as textile art exhibitions in nearby Hudson. June 2010: “The Art of Place” hosted by Sara Jackson at Fairlawn Mansion in Superior. This event is target specifically to high school students. Fairlawn will be used as a working classroom to explore cultural heritage, current preservation issues, architecture and decoration. Activities will include meetings with local history professionals, architects, interior designers hands on work as craftspeople teach the art of reproducing historically accurate painted wall treatments, tile and woodwork. By the end of the camp students will have an understanding of architectural vocabulary, craft, and a knowledge of historical structures in their community. 2007: We were one of 39 success stories in Renewing the Countryside WISCONSIN, a hard and soft cover book advocating, promoting and educating about rural Wisconsin culture, produced by the University of Wisconsin – Superior/UW – Extension. 2007: We hosted the Wisconsin Arts Board (WAB) reception (Spooner) and open business meeting ( Heartwood Conference Center), September 21 and 22 Washburn County. At this event, Wisconsin Lt. Governor Barbara Lawton said that northwest Wisconsin can serve as a creative economy model for other regions in the state. The WAB is a state-funded board that supports the creative economy in Wisconsin by setting policy and determining funding for arts education and local/regional arts initiatives. The survey was sent to 1,183 recipients, with a return rate of 53%. The total economic contribution (direct and indirect) was estimated at $13.8 – $18.4 million. A paper on the project was presented at the 2006 International Community Development Society conference. 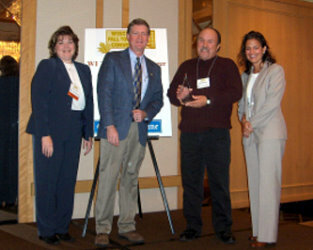 2004: Wisconsin Tourism Trailblazer Award awarded at the annual tourism conference. Below is the current Board of Directors. Board members are elected at the annual general membership meeting held each October. 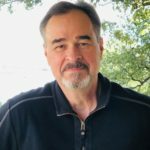 They are volunteers who help promote the organization, make financial decisions, maintain the website and social media, and publish a quarterly newsletter. Board meetings are held monthly on the 2nd Wednesday at 10 a.m. Site of each meeting is listed on the Events page of this website. Current and new members are welcome to attend.